For a company that ceased domestic production in 1969, diesels from American Locomotive Company continue to have a strong following among enthusiasts. At the top of the list are the nostalgic streamlined PAs, engines that once pulled some of the most glamorous named passenger trains of the now-distant past. Perhaps we think about the big, freight-hauling behemoths of the late 1960s, engines like the Century 628, C-630, and (a personal favorite of mine) the C-636. Over the course of diesel production, Alco designs evolved from sleek to utilitarian. But let’s take a time out for a moment and contemplate how the dawn of the Space Age affected the development of new railway equipment. Influenced by supersonic rockets, Kennedy-era Moon missions, and cult science fiction like Star Trek, many companies during this time fielded futuristic passenger trains. In 1968, Canadian National placed the gas turbine-powered TurboTrain into regular service. A year later, Penn Central fielded the Budd-built, super-sleek Metroliner. In 1972, Rohr Industries delivered its first rapid transit cars to Bay Area Rapid Transit, complete with sloped fiberglass nose cones. The next year saw French-built turbine-powered Turboliners on Midwestern Amtrak routes, followed by Rohr-built Turboliners in New York State in 1976. Across the pond, British Rail broke international speed records with the slope-nosed diesel High Speed Train in 1975. In the middle of all this fiberglass madness was the LRC project. Launched by CN in the mid-1960s, the concept was wrapped up in its acronym, which stood for “Light, Rapid, Comfortable” (en français: Léger, Rapide, et Confortable). Meant to handle the dense traffic of the Quebec City–Windsor corridor, the LRC was also charged with flying the banner of modernity. The project took several years to get off the drawing boards, and though test vehicles were on the rails in 1975, it was not until 1981 that they entered regular service. When they did, though, they were straight out of the Space Age playbook. The active-tilt train set looked almost like it had been extruded — it was in fact aluminum — and the power unit’s sloped face was perhaps less elegant than the British HST, but no less radical. What few realized, however, is that the LRC was an Alco in disguise. Underneath the futuristic skin, the LRC was powered by a 16-cylinder 251F engine block built by Alco’s sister corporation, Montreal Locomotive Works. This meant the LRC power unit was, essentially, an FPA-4 with a few more cylinders and the fanciest clothes ever worn by an Alco. It is thus one of the weirdest and, in my view, most interesting Alco products ever produced. By the time the LRC was launched, production of Alco designs was winding down. Bombardier purchased MLW in 1975 and delivered the LRC project. 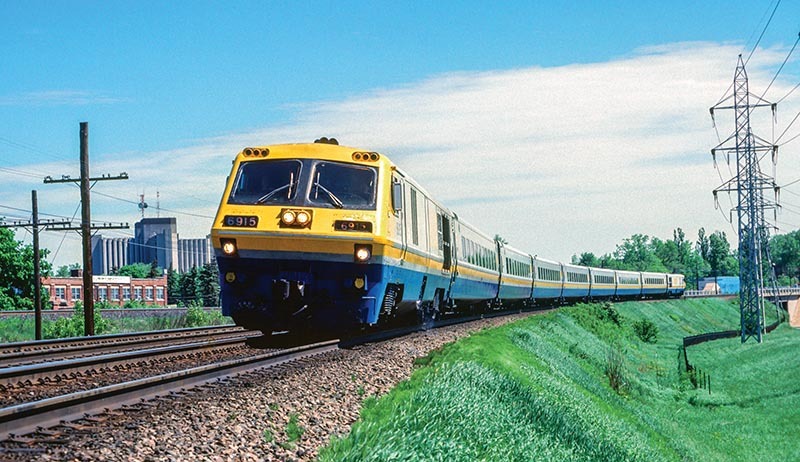 The LRC sets were plagued with problems from the get-go, but eventually they became the mainstay of VIA Rail’s Quebec City–Windsor corridor. The locomotives were finally retired in 2001, with at least two preserved. The cars, rebuilt and no longer tilting, remain in service with VIA. There’s a certain delight in knowing the futuristic LRC was powered by a prime mover design that dated back to 1949. Ironically, the 251 block would outlive Alco itself, produced under license by former rival Fairbanks-Morse up until last year. Many short lines and regionals rely on Alco locomotives to this day. 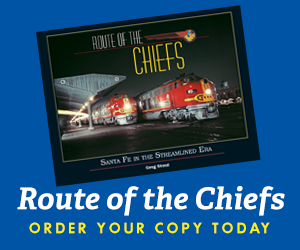 While we often associate Alco with classic railroading, the Space Age helped propel it into the future. —Consulting Editor ALEXANDER BENJAMIN CRAGHEAD is a transportation historian, photographer, artist, and author. 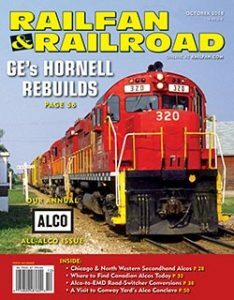 Read the rest of this article in the October 2018 issue of Railfan & Railroad!